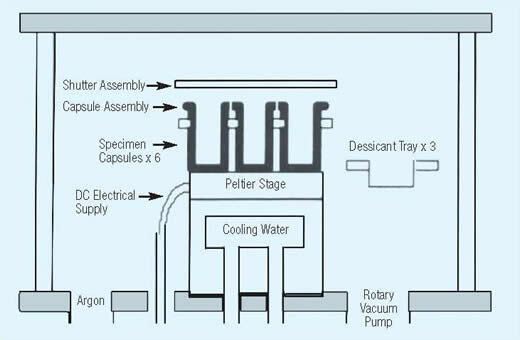 The application of freeze drying for specimen preparation for TEM and SEM is a well established practice. Its application is to reduce the distortion which occurs when a wet specimen dries by normal evaporation. This distortion is due to the forces of surface tension going from a liquid to a vapor phase such as water to water vapor, commonly the situation in a Biological Specimen. However, if we freeze the specimen and maintain it frozen, then by applying a vacuum, we can obtain a situation where we can remove the frozen water by sublimation, avoiding the liquid phase, and reducing the distortion. This rate of sublimation is very much a function of temperature and vacuum, and associated drying time which is on the order of several hours or longer. Ideally freeze drying could be carried out at temperatures below the recrystallization of ice, which will require an inordinately long drying period. In practice, temperatures of -60°C have been found to give reasonable results under vacuums achievable with two stage rotary pumps, having ensured that good, fast freezing of the specimen has been carried out initially. For particular applications, however, it can be necessary to freeze dry at temperatures below -80°C with lower sublimation rates for delicate specimens. This requires a better vacuum than can be obtained using a rotary vacuum pump. At normal temperatures and pressures the water in the specimen would dry by evaporation and would experience forces due to the effects of surface tension between the liquid and vapor interface, however, at pressures below the Triple Point, the solid phase can be changed to the vapor phase at a rate depending on the temperature, without the liquid being present. In the case of a frozen Biological Specimen where we are considering water (H2O) from solid to vapor phase the Triple Point pressure is a relative vacuum. There are notable exceptions such as Carbon Dioxide (CO2) where the Triple Point is higher than atmospheric pressure. The Figure shows the phase diagram for the ICE/WATER/WATER VAPOR system. The Curve A-B is termed the Sublimation Curve, at which the Solid and Vapor fire in equilibrium. Similarly for Curve B-C the Melting Curve and B-D the Evaporation Curve, terminating at C-P the Critical Point. The point of intersection of the Curves T-P is called the Triple Point, at which the three phases exist in equilibrium. It has a unique value for pressure and temperature, and is a reference point, for which the Celsius temperature scale is now defined. It should now be apparent that for any pressure in a system below the Triple point pressure, we can change water from the solid to vapor phase without the liquid phase being present, if the temperature at which we are allowed to do this does not have any restrictions. In the freeze drying of Biological Specimens there are however limitations on the initial temperature to which the specimen should be allowed to warm when drying is commenced. In practice therefore, the system pressure (relative vacuum) used, is much lower than the Triple Point pressure. The Figure gives an indication of the sublimation pressure (Saturated Vapor pressure at differing temperatures, and satisfactory freeze drying will be determined by this, and the partial pressure (Unsaturated Vapor pressure) of the water vapor in the vacuum system, which is required to be lower. The right hand scale gives an indication of Sublimation rates, (assuming partial pressure of H20 is not limiting) which are totally temperature dependent. The presentation and nature of a specimen prior to freeze drying depends on the user and the application. Irrespective of this, however, there is a pro-requisite for good (FAST) freezing, this is probably the most singularly influential factor on the final result, within the limitations previously considered of the drying routine. A range of cryogens and freezing techniques are being applied to the freezing of specimens, the understanding of the mechanisms of which, are still at an early stage. However, with exceptions, (Hyperbaric freezing containment of ice crystals is generally less than 20 micrometers from the surface, and Liquid Nitrogen (LN2) usually readily available and unsophisticated in its application, should be satisfactory for a range of specimen freezing. The technique for its application is that of plunge freezing by hand or mechanical device. Cells of petiole assumed their normal isodiametric shape after dying. Scanning Micrograph of an Aphid, Freeze dried using the K750 system and Sputter Coated with Gold. Aphids secret wax ribbons of which show good preservation, normally 'Lost' in Drying methods involving solvents. EMS 91080 Freeze Dryer and 93123 Turbo Freeze Dryer are available online from the EMS Catalog. For ordering or product information, click here.